Scratch the surface of any synthesizer, and you’ll find the heritage of a few great brands. Buchla has been responsible for some of the most innovative, creative, and sonically spectacular electronic musical equipment ever made, Softube is proud to have such a legendary name in their Modular system. 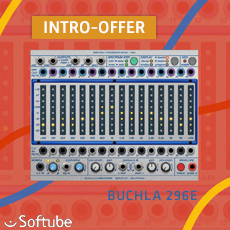 In addition to the previously released 259e Twisted Waveform Generator, take advantage of the myriad spectral processing capabilities of the big friendly filter bank; the new 296e Spectral Processor; the only software version of this module officially licensed by Buchla U.S.A.
16 band-pass filters are available, each with its own VCA on input, and envelope follower on output. They can be divided into two collections of eight, odd and even. In hardware this function can be used to split the module for use as a limited vocoder, with eight bands performing analysis and eight performing resynthesis. But of course in software you can affordably run a pair of 296e modules side-by-side, for a full 16-band spectral transfer vocoding experience. The user can adjust envelope decay times, and pre-emphasis may be applied to smooth the frequency response for even more malleable vocoding.